Nowadays, money worship is becoming more and more popular in Chinese society, and I am so sorry for that. My experience told me that money is just a tool, and it is not the purpose of our life or the key of happiness. I grew up in a poor, but warm family, and I was a happy boy at that time. For some reason, my family became very rich when I was a teenager. After that, my parents got lost. They did lots of things that hurt the family, hurt themselves, and hurt their children. I got lost too, almost became a bad guy, and despaired everyday. And then, my family went bankrupt, we became poor again, and heavily in debts. My parents were struck down by the reality, and became escapists. Fortunately, we paid all our debts after several years, and I became a diligent person and found myself back. After everything was over, I left my hometown with mixed feelings and started my new life in Beijing. Now I am working hard to make money, not because I love money or I want a luxurious life, just because I want to use this powerful tool doing some meaningful things in my life. Money is just a powerful tool, a double-edged sword, not everything. Riches Do Not Guarantee Happiness. That's what I have learned from my life. • Merry Christmas and Happy New Year, My DioEnglish Friends! • Happy New Year 2015! Money is a tool and not the key of happiness, but making money is one of important attempt in our daily life indeed, and of course it should be the only purpose. As a job-hunter, I think higher salary is more attractive, and money is one of the critical factors. Happiness comes from various elements including money, and the proportion of money is just an uncertainty. I have the same feelings for you. That so many people,including my parents and all my relatives,are crazy about money nowadays makes me feel pretty sad. For example,if my relatives don't see me having the potential to make a fortune,they will despise and tell bad remarks about me,but when they realize I have a bright future and have a chance to become rich,all their attitudes would be greatly changed. To tell the truth,I cannot bear people who treat me so snobbish.There are some serious problems in the beliefs of Chinese,I believe. sometimes ,it is the result of boundless pression and uncontrolled growth of desire for wealth , everyone may addict to it , and can't get out of the depth of vice , fortunately, you had't ever contract with this evil jolliess. Yes. 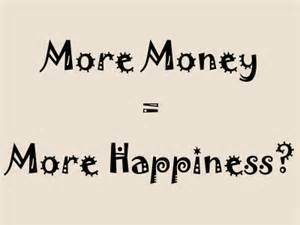 Money certainly means happiness. There is no doubt about it. I would trade my soul readily for 25,000,000 RMB, the sum necessary for a lifetime of moderate pleasure and leisure. Money is somehow a way of getting happiness, but not a necessary factor. I think Money ≠ happiness. The most happinest thing is to accompany with your family to eat dinner, to have a travel and to do other interesting thing in life . I still remember that day when i was 18 year ages and my father left me forever for cancer . the family lived in terrible and extremely poor life . We even could not afford our basic life like soap. in that difficult time no one who will sympathize with you. A common atmosphere in china "Keeping snobbish","The tea cools down as soon as the person is gone" but what we can do is to confront all difficults and overcome them. Money is just a tool to ensure your life extension and display your value .The most important thing is the feeling of happiness and to see the sunshine in your soul all the time . I think you are riht. However, some of my girlfriends' standard of boyfriend is rich. And my boyfriend now is fighting for the future. They want to find a boy who can offer hers high quality life. The best thing in life are free. We can earn money again when it was used out, but happiness can't be bought by money. I like the sentence very much:"I want to use this powerful tool(money) doing some meaningful things in my life." It's meaningless to endur our lifetime by making money instead of enjoying the life itself. Life, happiness is crucial. You just lived through many things,and thank godness the ending is good.Not everyone can find out the meaning of money in their life,luckily that finally you can get rid of the control of money,instead,to control it to do some good thing. Maybe, once there is a deep-rooted story for everyone. I am glad to share my experience with all of you. I also like the above words, "Money is just a powerful tool, a double-edged sword, not everything" , "I want to use this powerful tool doing some meaningful things in my life"
Money is a powerful tool. I quite agree. I agree with you that money just a tool and a part of our life.We cannot let money control ourselves.I feel so pity of your family and wish your life can be better now.Life is so good,just enjoy it. The well-chosen topic is very attractive.It's right that money isn't happiness and more money doesn't mean more happiness! You're right.Money is a tool,a double-edged sword, and not the key of happiness. I appreciate your views on money. You're a wise man.